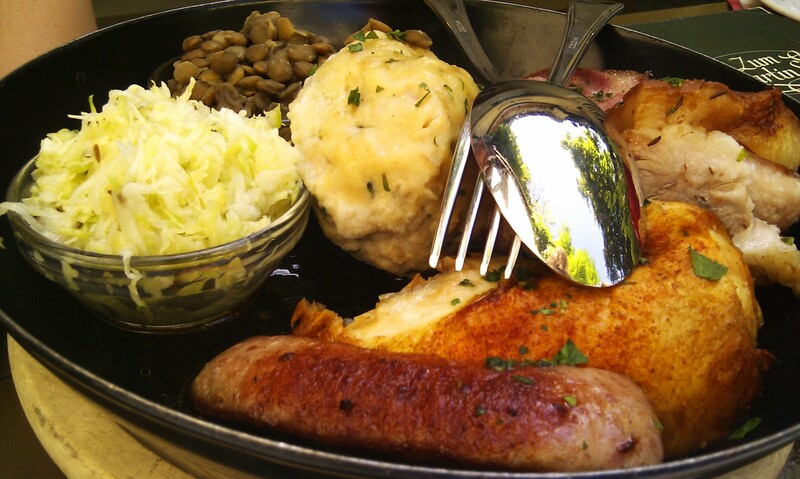 Summertime is a lot of things, but here in Vienna it is especially Heuriger time. A Heurigen is a wine-tavern where they serve the current year’s wine, which is called Heuriger as well. So basically, you go to a Heuriger to drink Heuriger. Food-wise they serve everything that’s good about Austrian cuisine: roast pork, sausages, dumplings, Wiener Schnitzel and the like. A couple of weeks ago, just when spring started to make way for summer, the girlfriend and I went to the Heurigen Martin Sepp in Grinzing, a most picturesque part of Vienna, famous for its number of Heuriger. It’s located at the foot of one of Vienna’s hills, the Kahlenberg (translated this means Kahlen Mountain, but coming from a part of Austria where they have actual mountains, I simply can’t call it anythings else than a hill). Zum Martin Sepp is rather popular and like many others which enjoy a certain popularity it tends to cater a bit to the touristy crowd. Nevertheless, their wine is grand and their food is very solid, especially if you like it rich and greasy (what sane person doesn’t?). What you see above is their Heurigenpfanne, which is sausages, a grilled chicken leg, pork roast, a big dumpling, lentils and sauerkraut. So next time you feel like drinking white in copious amounts (we did), accompanied by traditional, gut busting portions of food, go there. Just make sure you order their house wine and not any of their special ones, otherwise it might get a tad expensive.